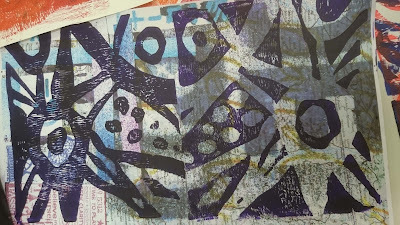 Close up of Jackie's monoprint. It has been a while between posts, the closure of the mail order business generated a huge amount of interest and I was inundated with orders. The website is now closed and I hope to be able to get all the outstanding orders posted by Thursday 3rd September at the latest. 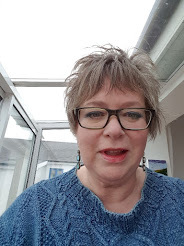 I had several offers to buy the business - but I wanted to keep the mailing list - for my newsletter and my online teaching when it eventually happens. As I am no longer tied down by the mail order business, I can travel for longer periods of time - watch this space. There will soon be news about me teaching more workshops in NZ 2017 and a new teaching tour of the United States 2017/18. It's all very exciting. Now back to the UK . . . It was the 3rd weekend of ExTex 4 on the weekend of 22/23 August. The 3rd weekend means colour theory and mono printing. I know we rarely use colour theory, but is important to know how it works if there is something not 'balancing' right in your work. 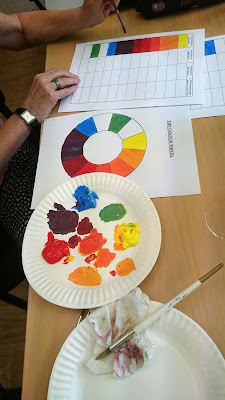 Once you have painted a colour wheel and mixed the colours for the tints, tones and shades chart - you will have a bit more of an idea and have all the information you need to refer back to. 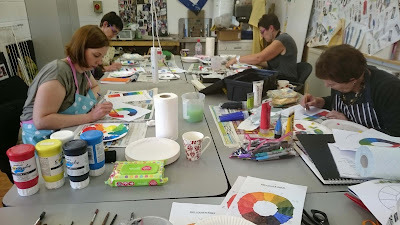 I always paint a colour wheel along with the group - you can never have enough practice. Mine is usually the messiest - but the information is there. 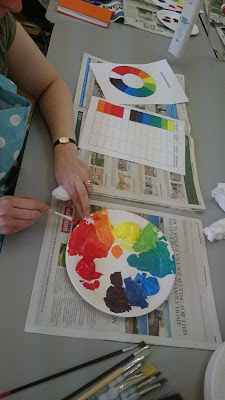 Painting the colour wheels and the tints, tones and shades chart. I have never yet achieved a violet - more of an aubergine!!! No matter which shade of red/pink and blue I use. One day . 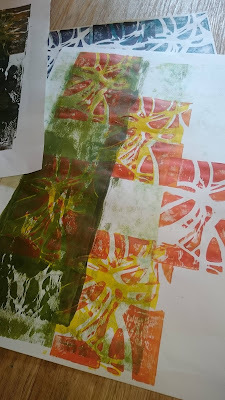 . .
After a day discussing the homework and colour theory, it is good to let off steam, so we spent the Sunday mono printing. 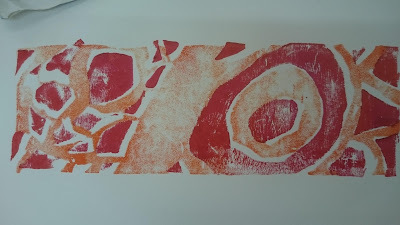 I love mono printing. 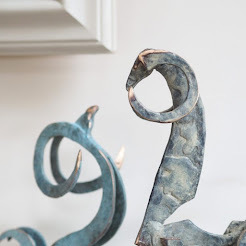 It is the simplest form of print and you can achieve some fabulous effects. 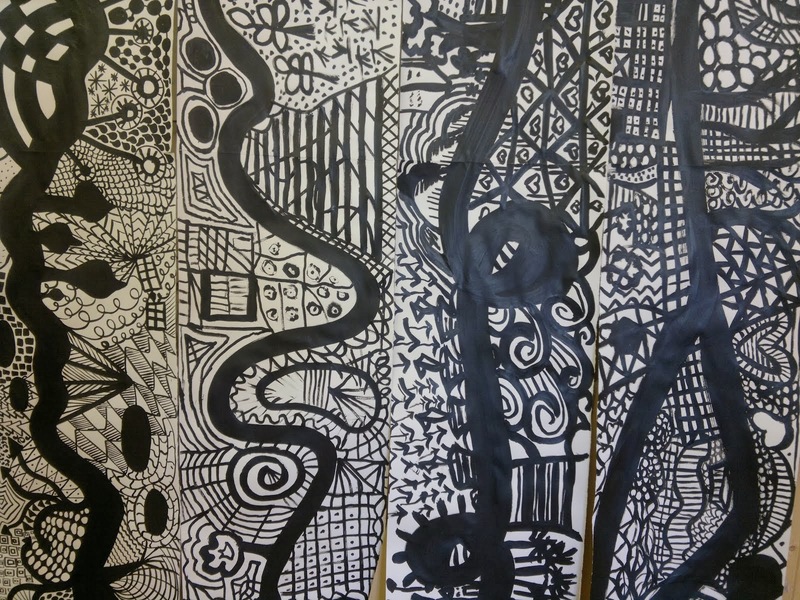 To use as backgrounds to print on further, or just for the beauty of themselves. 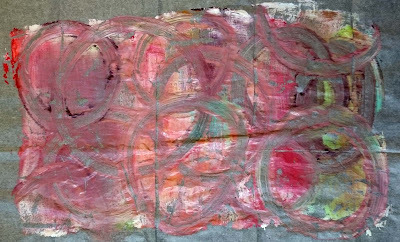 All you need is a roller/brayer and an old acetate sheet or laminated paper to roll out on. Simples! I love Rosie's face in this shot!!! 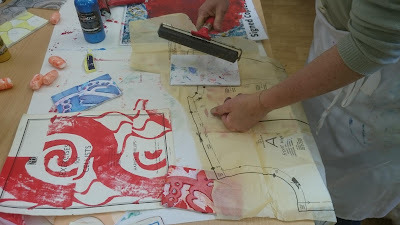 We printed onto various fabrics and papers using simple resists and tools. As you can see, this was a very free session, I try to balance the activities so if there is a day of 'hard work', then the next day is playful. The next session is on 12th and 13th September - this will be the large scale still life drawing . . . . no pressure then!!!!! I taught a great group of ladies at The Bridge in Brighton last weekend, I will post about that on Tuesday. I have a little R & R booked this Bank Holiday, in between packing up orders ready to post . . . 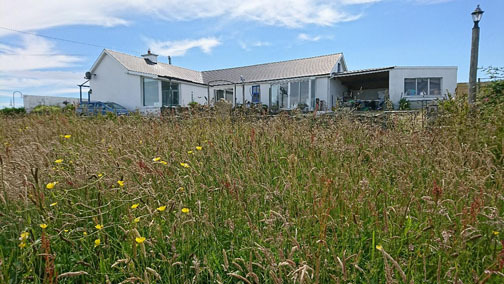 I am off to stay with my matey Susan Chapman on Bank Holiday Monday. 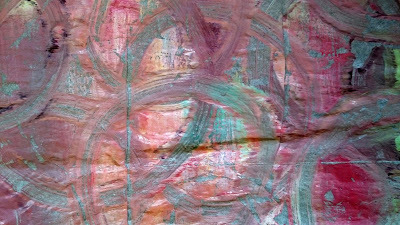 Her Open Studio (www.susanchapman.com) is on, so it will be great to see that, then in the evening we will be discussing our joint exhibition next March. Yes!! 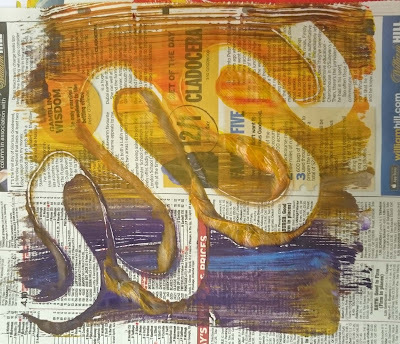 I am actually going to create some new work!!! It will be a shock for me too . 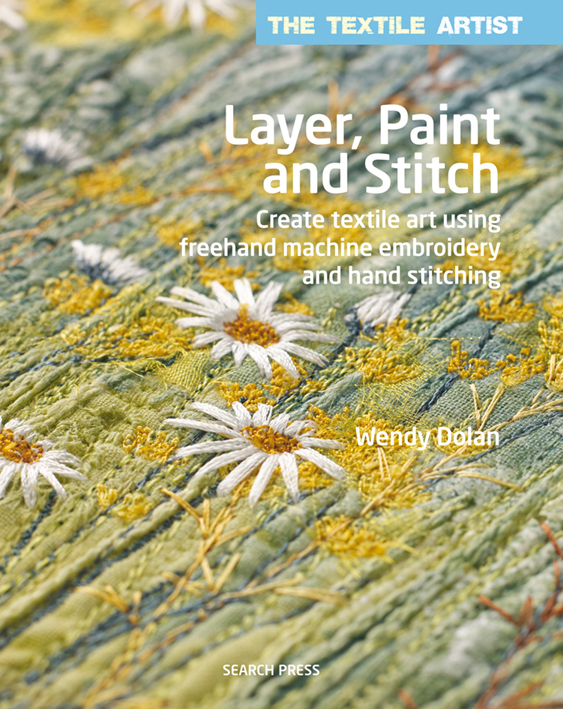 . .
Then I am off to Suffolk on Friday 4th September with another matey, Wendy Dolan. 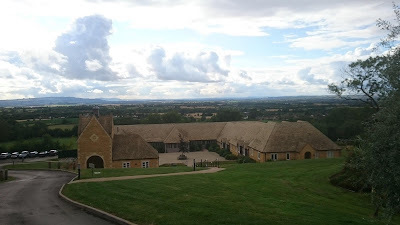 We are both teaching on the East Region Residential Weekend at Belsey Bridge Conference Centre. It should be a fabulous weekend. 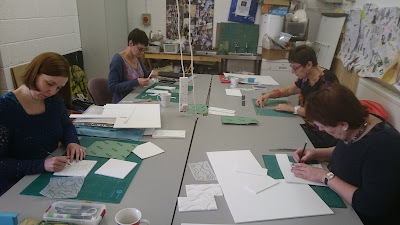 I am very much looking forward to meeting my group who are doing my workshop - Design to Stitch. It will also be wonderful to spend some time with Wendy. We are great friends, live in the same town - and never see each other as we both travel so much. We are sharing the journey from Sussex to Suffolk - so we will have a good catch up - Yipppeee!!! Wendy has her first book out - it is fabulous. You can buy it from her website. So - lots to show you next week. I hope you are having a great weekend. 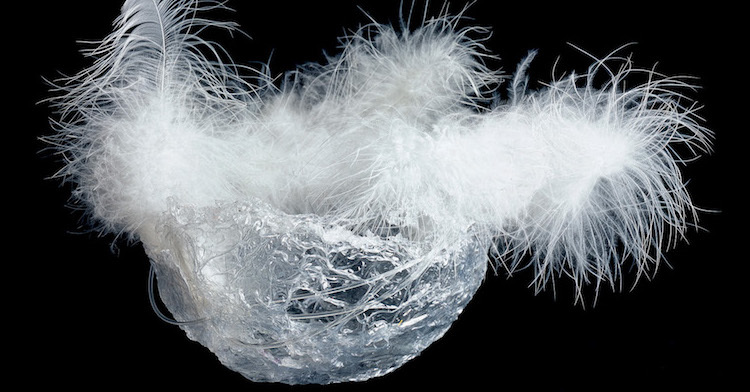 A fabulous design, beautifully printed. 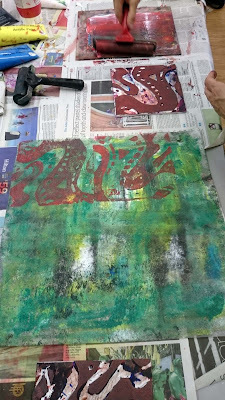 On the 25th and 26th of July we had the second weekend of the new ExTex (Experimental Textiles) 4 group. The previous weekend we had created the original designs and taken sections. 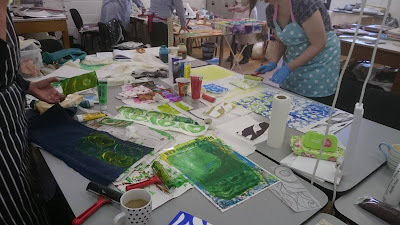 These were the sections the group then used to make their own printing blocks. 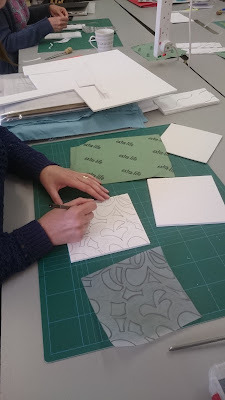 The designs are traced onto tracing paper and then transferred onto foam core board and self adhesive foam. 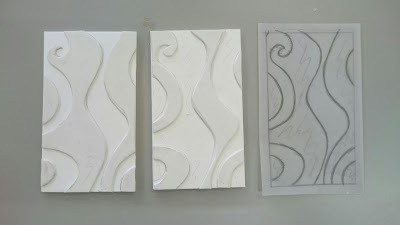 For one design - you need one piece of self adhesive foam and 2 pieces of foam core board all cut to the same size. 2 blocks from one design - showing the 'positive' design on the left and the 'negative' on the right. 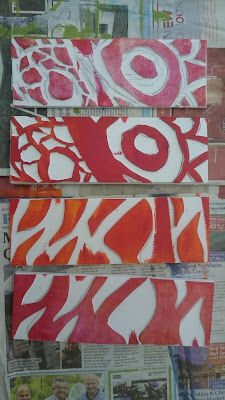 The design is then transferred onto all three. The design is then cut from the self adhesive foam. The 'positive' design is lifted out and stuck to one of the pieces of foam core board. 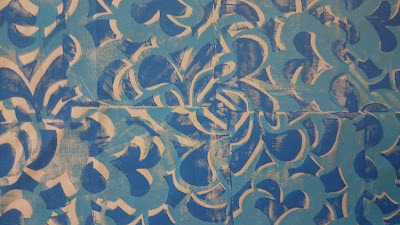 The design that is left is the 'negative' and this is stuck to the second piece of foam core board. As long as these blocks are cleaned with baby wipes and not run under the tap. They can last for several years. 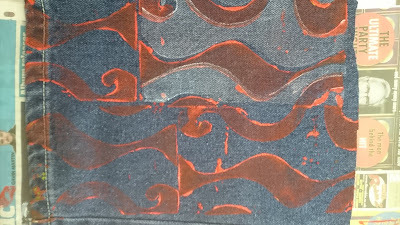 The above blocks printed onto denim. 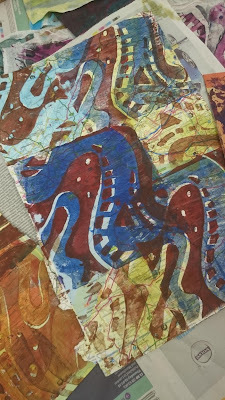 Experimenting with printing onto different papers and fabrics. Getting used to the blocks. Each student made at least 2 sets of blocks. 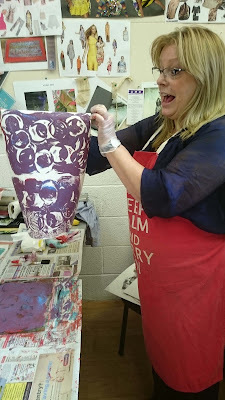 Getting down and dirty, working through the printing process. 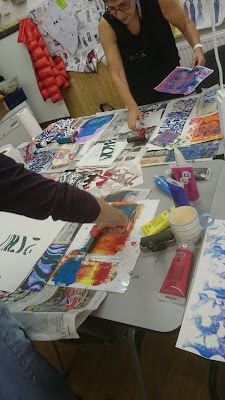 The next session with ExTex 4 will be the 22nd and 23rd of August when we will be looking at colour theory and colour washing the groups printed papers. The very beautiful Farncombe Estate late evening, near Broadway in the Cotswolds. 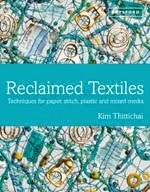 I have just had a few days away to attend the Textile Study Group summer School at Farncombe Estate. It is wonderful to be a student at least once a year, a chance to play and develop. It is even better to catch up with good friends that I have made when I have attended this summer school over the last 15 years or so. 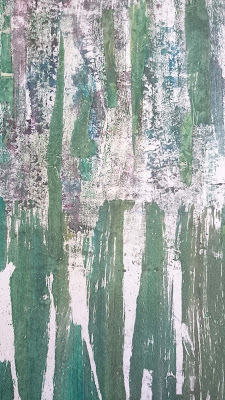 It takes me a while to 'get into' the correct mind frame, sometimes it doesn't happen till the last day - but I usually manage to develop something new to me. 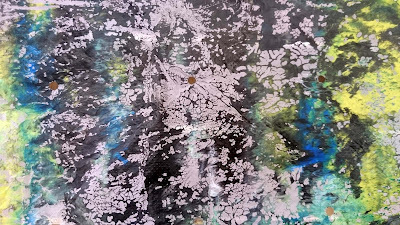 I am starting to think about the exhibition of work that I will be sharing with Susan Chapman next March at Fashion, Embroidery and Stitch at the NEC. 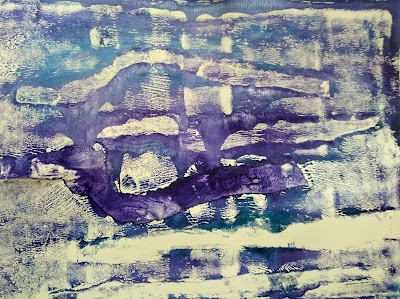 It has been a long time since I have exhibited - it is scary and exciting at the same time. I shall be going back to my 3D roots. 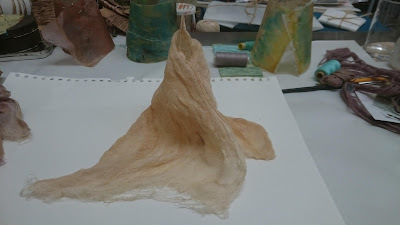 Playing with tea dyed scrim and melted beeswax. I THINK I know which direction I am going . . watch this space . 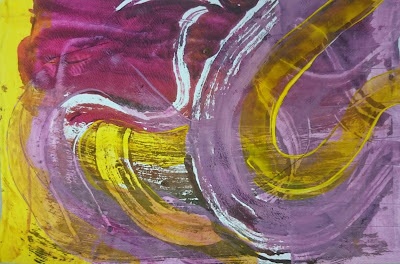 . .
Having had some time away and out of my usual frantic routine gave me some time to think . . . With my traveling more often and further afield to teach, it is becoming more difficult for me to keep up with getting the orders our for nid-noi.com on time. I have come to the conclusion that even I can't do everything by myself and be in 2 places at one time. So I have decided to stop the online shopping website from the end of this month (August 2015). I would like to thank all of you who have been customers over the years. I will still carry all the products for my workshops and will still sell odd products on my stand at Fashion, Embroidery and Stitch in March. Making the decision has been a great relief. Everything in life has a time span. 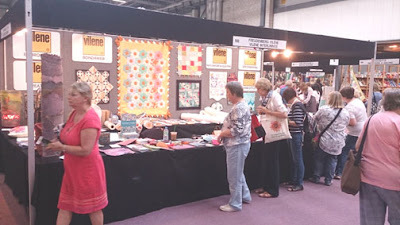 This week brings us to The Festival of Quilts - a VERY exciting show. I will be running the Freudenberg Vilene Retail stand no M8. We are opposite the Fine Art Quilt Masters as Vilene sponsor the main prize. Laura and I will be on hand to answer any questions you have about any of the Vilene products. We don't sell anything on the Vilene stand - we are for information only. 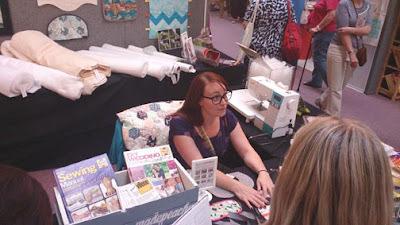 Laura Strutt is a great designer crafter and the author of just the SIX books!!! she is 2 ahead of me already . 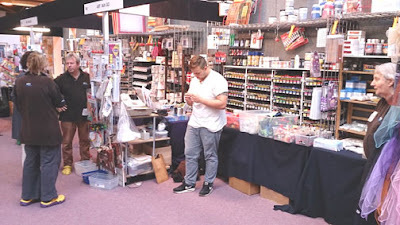 . .
Art Van Go will also be at the show - on Stand P5 - they will have all the paints and gilding flake that I use as well as my favourite Vilene products. 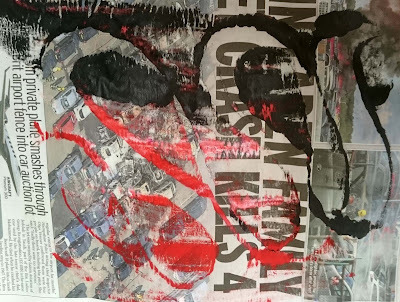 Art Van Go will be on stand P5 with all you could you desire. Do come and see us and have a chat. Hopefully see you very soon.